When you stay at Clarion Hotel Airport & Conference Center in Charlotte, you'll be near the airport and convenient to Renaissance Park and Billy Graham Library. This hotel is within close proximity of Freedom Park and Charlotte Nature Museum. Make yourself at home in one of the 102 air-conditioned rooms featuring refrigerators and microwaves. Your room comes with a pillowtop bed. Flat-screen televisions with cable programming provide entertainment, while complimentary wireless Internet access keeps you connected. Private bathrooms with shower/tub combinations feature deep soaking bathtubs and complimentary toiletries. Enjoy recreational amenities such as a fitness center and a seasonal outdoor pool. Additional amenities at this hotel include complimentary wireless Internet access and tour/ticket assistance. Enjoy a satisfying meal at a restaurant serving guests of Clarion Hotel Airport & Conference Center. Quench your thirst with your favorite drink at a bar/lounge. Breakfast is available for a fee. 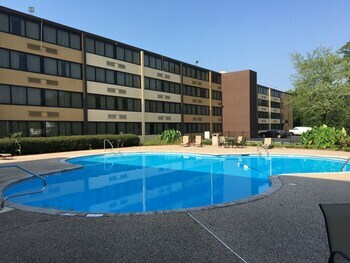 Clarion Hotel Airport & Conference Center Charlotte is the best Charlotte lodging choice for your trip to North Carolina. With numerous amenities for guests such as 24 hour front desk, fitness center, dry cleaning service, you will wake up at Clarion Hotel Airport & Conference Center Charlotte feeling excited every day for your time in Charlotte. Don’t let this amazing reservation opportunity pass you by, book your stay at Clarion Hotel Airport & Conference Center Charlotte today to make the most of your time in Charlotte, North Carolina.